Happy anniversary Milwaukee Region! April 30, 2010, officially marked -- to the day -- the 50th anniversary of the founding of the Milwaukee Region. It was 50 years ago on that day when 10 men in the Milwaukee area who had petitioned to form a separate region received word that the national office of Porsche Club of America had deemed it appropriate to establish a region in Milwaukee. Previously, these 10 men were affiliated with the Chicago Region PCA. April 30, 1960, marked the beginning of a long and rewarding journey during which time thousands of people who shared the same passion for Porsches got together to enjoy the people and the cars. Fifty years later, we're stronger than ever. Read a recap of the region's 50th anniversary general membership celebration that occurred April 30 at the Harley Davidson Museum in Milwaukee. Also read about more events that are scheduled for this year as we mark our 50th anniversary with a variety of festivities. We hope all members will participate in one or more activities this year, a truly historic year for our region. More than 140 Milwaukee Region members and their guests -- and their Porsches of course -- gathered at the Harley Davidson Museum in Milwaukee to toast the 50th anniversary of the Milwaukee Region. 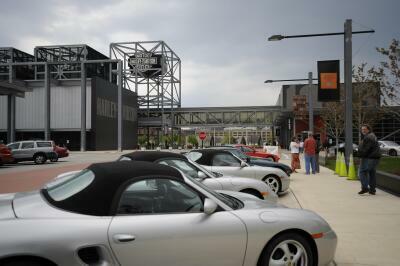 Two streets within the museum grounds were lined with Porsches representing a variety of models, years and colors. While the Porsches "rested," members enjoyed a get together inside the museum. Read the recap here. The page includes links to videos from the event, as well as a link to a photo album. May 8 - Drive to track, tour the track and dine at Lake Street Cafe. This is a social event. In follow-the-leader style, take a fun route to Road America. Then tour the track (if you like) and enjoy a great dinner (you order from the menu and pay your own tab). Details here. RSVP deadline is May 1. June 12 -- 50th anniversary Spring Driving tour. Details here. This is an all-day tour that will take you on the roads less travelled. The tour starts in Delafield, goes west to the Dells area, returning at the end of the day to dinner at MJ Stevens in Washington County. Transferring from the Chicago Region are James Lewan and his wife Kris of Oshkosh with their 1999 Boxster. Correction: My apologies to Trudy Pesic, family member of George Pesic, for mis-typing her name in the listing of new members in the April newsletter. Welcome Trudy! In this column, we get to know new members a little better through input they provide about themselves and their Porsche. Claudio Martens also drives a 944. His is a 1988 944S, black in color with a manual transmission. The interior is black and tan. It has approximately 83,000 original miles on it. The wheels are 17" Boxster "twist" wheels that have been chrome plated. He bought the car in May 2009. He searched for various Porsches on Auto Trader and found the 944 at a used car dealership in Burlington. “It needed some work but was in pretty good shape so I got it,” he said. His first Porsche, Claudio notes he has “always liked German automobiles. In the past I have had VWs and also currently own a BMW. Porsches are not very common in the Milwaukee area and are a great conversation piece.” A senior hardware engineering technician at Rockwell Automation in Milwaukee, Claudio is interested in attending tech sessions, social and concours d’elegance events. Steve Sticker owns a 2007 997 C4S that features a cold air intake kit, Maxflo muffler and ECU modification. He’s owned the car since January 2010. He found it through at friend at Concours Motors in Glendale. Steve owns Sticker & Associates, a manufacturer’s rep for plumbing products. Mark Holzwart drives a 2009 Cayman, black/black. He’s owned it less than a year. He researched various car review websites and major car magazines in his quest to own a Porsche. “I especially liked the design of the Cayman and the fact that it is not the typical Porsche seen on the road. It has a very futuristic look, but also classic and recognizable” Mark said. Mark would like to learn more about driver education and tech sessions that detail how to care for and maintain the interior and exterior of Porsches. “I look forward to interacting with others in the club who have the same passion for their vehicles.” Mark is the owner and entrepreneur of a restoration and mitigation contracting company and owner of a technology serving the property and casualty insurance industry. He says the reason he bought a Porsche is “all the time, cars are compared to Porsche. I own a 2001 SC281 Saleen Mustang and they say it will handle like a Porsche. I watch racing on TV and the Porsches are always up front. So why try to make one - buy one. Glad I did.” Chris is a master engineering technician at Eaton Corporation working with alternative energy control. A big Milwaukee Region welcome to these new members. If you’ve joined the region recently or have been a member for years and haven’t had a chance to tell us your story about you and your Porsche, send a note to online newsletter editor Bev Jurkowski. beverly.jurkowski@sbcglobal.net We’d be happy to include your information in a future issue of Steinlifters Online. Over the years, the Milwaukee Region has had several father/son, father/daughter combinations who have enjoyed participating in region events together. Here's the latest such combination that we're aware of. Terry Royals and his daughter Emily share a passion for autocross. Read the details here. Porscheplatz (Porsche owner corrals) planned at five American Le Mans series races this year. Driving your Porsche to one of the American Le Mans races this season? You can park your Porsche with other Porsches while at the event. Details here. There's still room for you at Parade 2010 which will unfold in nearby St. Charles, Ill. There hasn't been a PCA Porsche Parade in as close proximity to our area since we hosted the 2001 Parade right here in Milwaukee. Register now to be part of total immersion in PCA. Hundreds of Porsches and their owners will gather at Pheasant Run in St. Charles, Ill., to participate in a wide variety of activities. Even if you do not want to autocross or rallye or spiff up your car to concours d'elegance specs, Parade is a fun way to spend some time. Great spectating at many venues. Here's a sneak prevew video of what's in store. A redesigned region website is on the drawing board. We will launch it soon. It will feature more graphics and better navigation to help you find what you to maximize your membership. The web address remains the same so no need to change your bookmark.